http://www.JewishWorldReview.com | If insanity is doing the same thing again and again but expecting a different outcome, then the federal government's strategy for keeping higher education affordable is crazier than Norman Bates. For decades, American politicians have waxed passionate on the need to put college within every family's reach. To ensure that anyone who wants to go to college will be able to foot the bill, Washington has showered hundreds of billions of dollars into student aid of all kinds -- grants and loans, subsidized work-study jobs, tax credits and deductions. Today, that shower has become a monsoon. As Neal McCluskey points out in a Cato Institute white paper, government outlays intended to hold down the price of a college degree have ballooned, in inflation-adjusted dollars, from $29.6 billion in 1985 to $139.7 billion in 2010: an increase of 372 percent since Ronald Reagan's day. And what have we gotten for this vast investment in college affordability? Colleges that are more unaffordable than ever. Year in, year out, Washington bestows tuition aid on students and their families. 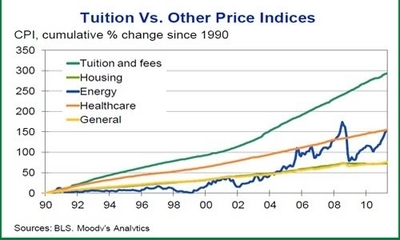 Year in, year out, the cost of tuition surges, galloping well ahead of inflation. And year in, year out, politicians vie to outdo each other in promising still more public subsidies that will keep higher education within reach of all. Does it never occur to them that there might be a cause-and-effect relationship between the skyrocketing aid and the skyrocketing price of a college education? That all those grants and loans and tax credits aren't containing the fire, but fanning it? "We've got to make college more affordable for more young people," President Obama declaimed during campaign appearances at the universities of Iowa, North Carolina, and Colorado last week. "We can't price the middle class out of a college education." Like George W. Bush and Bill Clinton before him, Obama argued for keeping the aid spigot open. He hit all the usual notes ("extend the tuition tax credit � cap student loan payments � make sure the Pell grants are there"), and for good measure used the federal student-loan interest rate -- which will double in July unless Congress acts -- to paint Republicans as clueless Grinches. Yet Mitt Romney also wants to extend the current rate. The myth that government can control the price of higher education by driving up the demand for it commands broad and bipartisan belief. The more government spends to hold down the cost of higher education, the higher that cost soars. That isn't a coincidence. Federal financial aid is a major source of revenue for colleges and universities, and aid packages are generally based on the gap between what a family can afford to pay to send a student to a given college, and the tuition and fees charged by that college. That gives schools every incentive to keep their tuition unaffordable. Why would they reduce their sticker price to a level more families could afford, when doing so would mean kissing millions of government dollars goodbye? Directly or indirectly, government loans and grants have led to massive tuition inflation. That has been a boon for colleges and universities, where budgets, payrolls, and amenities have grown amazingly lavish. And it has been a boon for politicians, Republicans and Democrats alike, who are happy to exploit anxiety over tuition to win votes. But for students and their families, let alone for taxpayers who don't go to college, it has been a disaster. The more government has done to make higher education affordable, the more unaffordable it has become. Doing more of the same won't yield a different outcome. By now, even Norman Bates would have figured that out.